Smart stores allow smart shopping. Gone are the days when mobile phone stores were just rows upon rows of mobile phones behind glass or dummy phones heavily chained to tables, as if one can actually use them. Naming their newly redesigned stores Smart Stores, which features a self-service section, technical expert counter, sales and account management counters and the demo area or launch pad, where subscribers can tinker with the latest devices and gadgets, Smart Communications is changing the current ways of the market. What makes their new store design smart is that it actually helps the customer get the information that they need in the most efficient manner. The self-service section enables subscribers to log on to my.Smart to check and pay their bills, purchase prepaid packages, submit help tickets, and even cash in their rewards points online absolutely free. Smart Load retailers meanwhile, can check their load wallet balance, request for statements of account, and block load wallets for lost SIM also free of charge. 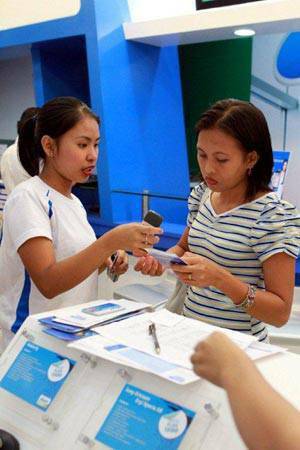 In some Smart Stores, the self-service section also features Load Connect, an automated service that enables subscribers to purchase airtime in P30, P60, P300, P500 and P1,000 denominations as well as reload their Smart Money accounts. Through its Smart Stores, Smart tries to make technology more approachable to shoppers not only by allowing them to hold and test the gadgets on display at the launch pad, but also by allowing them to go one-on-one with any of the well-trained staff at the technical expert counter. There are currently 17 Smart Stores nationwide: seven are located in NCR, particularly in Rockwell Power Plant Mall in Makati City; Sta. Lucia East Grand Mall in Cainta, Rizal; Mall of Asia, SM Bicutan, SM Sucat, Shangri-La Plaza Mall in Mandaluyong City and Festival Mall in Filinvest, Alabang. Six are located in Luzon, inside SM City malls in Baguio City; Calamba, Laguna; Clark Freeport Zone; Naga City; Pampanga and Rosales, Pangasinan. There are four Smart Stores in the Visayas and Mindanao, specifically in SM City Iloilo, Tacloban City, Tagbilaran City and Valencia, Bukidnon. “Consistent with our efforts to lead the country’s shift to smart phones, we have to provide facilities where Filipinos can experience and thus, better appreciate the value of wireless technologies now available to make their lives better. This is why the interior of our Smart Stores are sectioned according to function, to make it easier for subscribers to ‘shop, explore and connect’,” said Maloo Agoncillo, Smart’s Retail Store Operations department head. mobile mobile business mobile entrepreneurs mobile marketing agency mobile phones mobile technology smart commu Smart Communications Smart Communications, Inc.